If you have a passion for both music and teaching, becoming a music teacher could be your dream. Not only can you teach children, teens and adult students about music, playing an instrument and theory, you can also tap into your skill set and do what you love on a daily basis while you earn a living doing it. 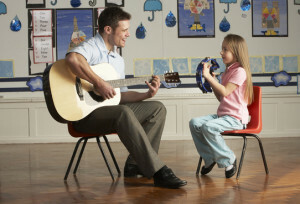 Read on and find out if you will need a Master’s degree to work as a music teacher. What Will You Learn in a Bachelor’s Degree Program Majoring in Music Education? What Will a Master’s Degree Prepare You For? While a majority of music teachers in the K-12 setting have a Bachelor’s degree in Music Education, it can be helpful to master theories in the field by earning a Master’s. If you possess a Bachelor’s degree in the field and you are willing to audition playing your instrument of choice, you may be accepted into a graduate program where you can learn more about ear training and education. Since you have already covered two years of music theory with your B.A. training, you will take courses in Music Development, Human Development, Music Techniques, Music Education, Sight Reading, Arts and Education and Vocal Training. It is not a requirement to earn your Master’s to become an educator in all settings, but if you would like to earn your teacher certification and you have not yet done so you may have the opportunity to while you complete your M.A. program. The requirements to work as a private teacher are lenient, but if you plan on teaching in a public school you will need to meet state board licensing requirements before you can teach. Be sure to check into the certification requirements to teach at a primary or secondary school so that you complete to right state-approved program. In most cases, boards require a bachelor’s degree and specified number of hours of teaching in the classroom. There are a few states that require a master’s after they have begun teaching. When you enter into a M.A. program, you can complete the coursework on a full-time basis in about 2 years. Make sure that you compare different programs and you can be both an outstanding musician and a skilled teacher all at the same time. Take the time to compare regionally and specialized accredited programs and then you can start planning on becoming a music teacher who makes a difference in the lives of their students.